Strategically situated at the crossroads of Tampa’s dynamic eastward expansion and Lakeland’s fast paced southern growth, is the town of Mulberry, Florida. There are probably few communities better poised for economic recovery than Mulberry, Florida which is situated at the center of a super region representing the 10th largest economy in the United States. Major projects underway or nearing start-up which are influencing Mulberry’s growth include Mosiac Company’s Streamsong Resort just south of Mulberry which boasts two world class golf courses which are already hosting golfers from throughout the world and a 218 room five star resort which will open this fall on the property’s 16,000 acres; Landstar’s intention to develop a 6,000 home community in Mulberry; Tampa Electric Company’s construction of a $700 million, 460 megawatt addition to its Polk Power Station on State Road 37 south of Mulberry which will begin next year; the Florida Polytechnic University Campus under construction in the adjoining City of Lakeland; the CSX Integrated Logistic Center on State Road 60 which will transform logistics development in Florida and beyond; the ongoing development of the LEGOLAND Florida attraction in nearby Winter Haven which draws 1.6 million visitors a year; and the continuing expansion of the Port of Tampa which relies heavily on good and raw materials produced in the Mulberry area for itts success. Mulberry is the Phosphate Capital of the World and Mosic and CF Industries are modernizing their operations through new technologies making fertilizer production a viable business for decades to come. One of the South’s largest family-owned businesses, Badcock & More, has been headquartered in Mulberry since 1904 and numerous other companies operate in the City’s rail-served industrial park and throughout the community. 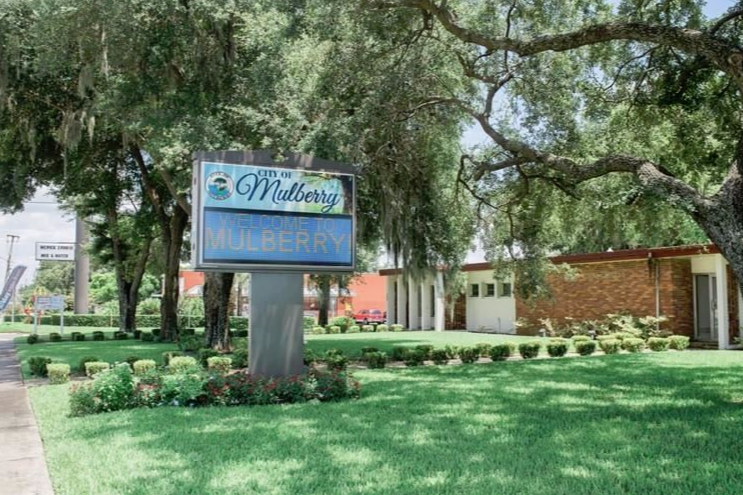 Mulberry has been called “The Crossroads of Florida” due to its central location in the state and the Florida Department of Transportation reports that…….vehicles pass daily through the intersection of State Roads 60 and 37 at the doorstep of City Hall.